Symptoms may have Single pathophysiologic process. Lack of specific diagnostic tests. Parental anxiety – pressure for quick therapeutic relief. –Symptoms – minor problem or life threatening process. –Determine – most likely pathogenic mechanism. –Simplest effective therapy for the underlying process- often may be symptomatic only. –Occasionally , use of more extensive and invasive diagnostic efforts including bronchoscopy.–Evaluation of the effect of therapy. When Chronic Respiratory Complaints Can be Life Threatening/ Serious? Wheeze associated lower respiratory tract infection. –Laryngeal obstruction- laryngomalacia, laryngeal webs, cysts and laryngoceles, foreign body. Physical examination -unrewarding, although changes in its severity and intensity due to changes of body position should be assessed. In most cases, direct observation by laryngoscopy is necessary for diagnosis. Undistorted views of the larynx are best obtained with fiberoptic laryngoscopy. Others-Contrast esophagography,Fluoroscopy, CT, and MRI are potentially useful diagnostic tools. Cough is a reflex response of the lower respiratory tract to stimulation of irritant or cough receptors in the airways’ mucosa. Receptors- pharynx, paranasal sinuses, stomach, and external auditory canal, the source of a persistent cough may need to be sought beyond the lungs. Inspiratory phase: Inhalation generates the volume necessary for an effective cough. Compression phase: Closure of the larynx combined with contraction of muscles of chest wall, diaphragm, and abdominal wall result in a rapid rise in IT pressure. Expiratory phase: The glottis opens, resulting in high expiratory airflow and the coughing sound. Very common – Asthma, Recurrent infections. Uncommon – Aspiration ( GERD, Uncoordinated swallowing), Intrabronchial/ retained foreign body, Cystic fibrosis, ciliary abnormalities, immunodeficiency , Congenital abnormalities of respiratory tract. •How and when did the cough start? •What is the nature and quality of the cough? •Is the cough an isolated symptom? •Is there a family history of respiratory symptoms, disorders and atopy? •What medications is the child on? •Does the cough disappear when asleep? Acute cough- A recent onset of cough lasting <3 weeks. Prolonged acute cough- resolving over a 3–8-week period. Chronic cough – A cough lasting >8 weeks. Night cough Sinusitis, reactive airways disease ,Seasonal Allergic rhinitis. Past history – recurrent rhinitis, atopic dermatitis, eczema, pertussis, recurrent or severe respiratory illness in infancy or childhood (Immunodeficiency, CF, bronchiectasis). Domestic smoke pollution including parental smoking. Tachypnea, use of accessory muscle – respiratory distress. Pulse – tachycardia–CCF, fever, distress. JVP – raised in CCF. 4. Anthropometry :Evidence of FTT – consider CF, immunodeficiency. Nose – nasal discharge – blood stained/ serous/ purulent; DNS. Pharynx – congested/ grey membrane. Tonsils – enlargement/ congestion/pus points. Ear – discharge (ASOM), retraction of TM. •Eczema, transverse nasal crease, rhinitis, mucosal cobblestoning, injected conjunctivae – consider RAD, allergy. •Decreased movement of either hemithorax. Stridor, in combination with cough, generally indicates obstruction at the level of larynx or trachea. •Feel for abnormal vibrations – rhonchi, friction rub, crackles, crepitus (subcutaneous emphysema- pertussis). •Area of dullness- pleural effusion , empyema, consolidation. •Percuss for upper margin of liver dullness. •Added sounds – crackles, rhonchi, pleural friction rub. -absent/ decreased – pleural effusion, atelectasis. -Increased – consolidation, atelectasis with patent bronchus. •Specific cough- A specific cough is one in which there is a clearly identifiable cause. •Non-specific (isolated cough) – The term ‘‘non-specific isolated cough’’ has been used to describe children who typically have a persistent dry cough, no other respiratory symptoms (isolated cough), are otherwise well with no signs of chronic lung disease and have a normal chest radiograph. •A chest radiograph is indicated for most children with chronic cough. –Also helpful in identifying extra pulmonary causes. Normal X-ray: Asthma, GERD, Postnasal drip, Bronchitis and upper airways disease. •Not indicated if mild specific disorder is definitively diagnosed (asthma/allergic rhinitis or if a pertussis-like illness is clearly resolving). •May identify parenchymal disease not apparent on chest X-ray. •Useful in the diagnosis of disorders of smaller airways e.g. bronchiectasis (Gold standard)-more sensitive than spirometric indexes. •Includes peak flow meter & spirometric examination. •Useful in evaluation of children with chronic cough and normal chest X-ray. •Peak expiratory flow (PEF) measurement should be focused on the diagnosis of airflow obstruction. •PEF measurement to assess bronchodilator response have limitations compared to FEV1. Age- children aged 6 years and in some children 3 years if trained pediatric personnel are present. •24- Hour esophageal pH monitoring- high sensitivity & specificity. •Negative pH profile reports should be interpreted cautiously. •Dual probe pH monitoring has improved the sensitivity of esophageal pH monitoring in patients who have non- acid reflux. •Barium swallow- low sensitivity & specificity. •Both direct & fiberoptic – laryngoscopy very useful. •A thorough ENT examination & laryngoscopic examination complements each other in diagnosing upper airway causes of persistent cough. 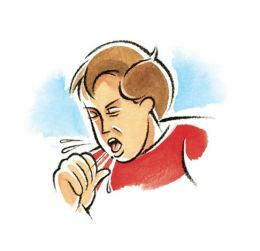 •Hypersensitivity to methacholine is useful in evaluating patients with possibility of cough variant asthma. •Although a positive test is not diagnostic of asthma, a negative test effectively excludes asthma as the diagnosis. •Flexible bronchoscope- evaluating upper and lower airway structure and function. •Useful in identifying unrecognized FB in bronchus and airway sampling either by mucosal biopsy or bronchoalveolar lavage. •Bronchoalveolar lavage useful in identifying organisms not found on culturing of sputum and blood and unusual organisms resulting in parenchymal disease. •Both can yield useful information that can modify the treatment. •Fibre- optic bronchoscopy- 64% sensitivity in children. •Effective management is possible by establishing a precise diagnosis. •Systematic approach- effective in identifying an underlying cause in > 80 % cases. •Establish diagnosis & institute appropriate specific therapies. •If the putative specific therapy does not stop the cough, the presumptive diagnosis is either wrong or therapy submaximal. •Asthma/ cough variant asthma – bronchodilator therapy, inhaled corticosteroids, other asthma therapies. •GERD – positional therapy, dietary modifications, anti-reflux therapy, surgical correction. •Sinusitis – antibiotics, decongestive therapy, intranasal decongestive/ steroid spray. •Bronchiectasis – chest physiotherapy/ postural drainage, judicious use of antibiotics, expectorants/ mucolytics, bronchodilator therapy, surgical resection. •Psychogenic & habitual cough – counseling and psychological therapy, avoidance of mental stress. •Lung abscess – judicious use of antibiotics, removal of precipitating cause, surgical intervention if necessary. •Foreign body aspiration – FB removal, antibiotics, physiotherapy and exercises. •Post acute viral respiratory infection – symptomatic treatment, bronchodilators, oral steroid therapy. •Congenital anomalies/ malformations – surgical corrections, symptomatic & supportive therapy. •Drug induced cough – stop the drug. •Radiographic lung infiltrates that fail to completely clear within a 4-wk period. •May be febrile or afebrile and may display a wide range of respiratory symptoms and signs. •Recurrent infiltrates, wheezing, and coughà asthma, even in the 1st year of life. •1st year of life with recurrent lung infiltratesà pulmonary hemosiderosis . •Paroxysmal coughing à pertussis syndrome or CF. Persistent infiltrates, especially with loss of volume, in a toddler à foreign body aspiration. •Cataracts, retinopathy, or microcephaly suggest in utero infection. •Chest CT -precise anatomic detail concerning the infiltrate. •Bronchoscopy is indicated for detecting foreign bodies, congenital or acquired anomalies of the tracheobronchial tract, and obstruction by endobronchial or extrinsic masses. •inhalation and physical therapy for excessive secretions, antibiotics for bacterial infections, and maintenance of adequate nutrition. •An appropriate diagnosis and effective specific therapy- associated with good prognosis with cure rate of 84-97%. •Prognosis good in single etiology cases than multiple etiology cases. •A systemic approach both for the diagnosis and treatment- essential for better prognosis. •Poor prognosis- misdiagnosis & inappropriate therapy. •Behrman,Kliegman & Jenson, NelsonTextbook Of Pediatrics ,19th edition. •Ghai, O P ; Essential Pediatrics ,7th edition.